Great recipe! Just wondering how many calories would be in it without the pasta? This was amazing!!!! The only things I changed were adding 1 clove minced garlic in with the onions and 1/2 cup sour cream. My hubby had 2 platefuls!! Gina, I have recently discovered your website and am so happy! I have made your meatballs with tzasiki sauce and the oatmeal in a jar, both of which were wonderful. Thank you!!! Would this freeze well if I took out the pasta and cooked that up as I thaw single servings? My husband doesn't care for mushrooms, but I love them. I have been wanting to try this, but it would only be me eating it. Just a heads up Worcestershire sauce has anchovies in it, for the vegetarians out there. It all depends on the person though. This looks great though! Tasted good but the sauce was too runny, almost like a soup. I'm not sure what I did wrong! I wanted it to be a little thicker and creamier rather than watery. However, this was my very first time cooking mushrooms! Maybe there is a secret I don't know about. Loved this one, Gina! 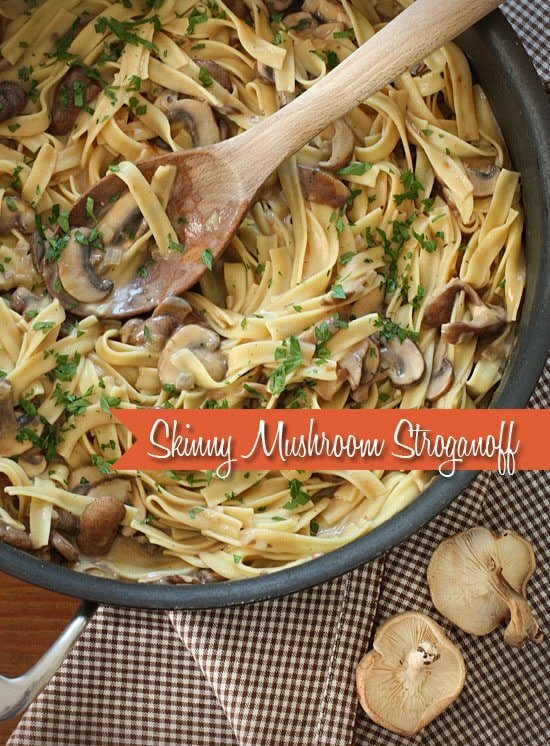 I used king trumpet mushrooms, along with shiitake and crimini. This was so good! I did need to add in the second cup of veggie broth. Made it for a vegetarian friend and my meat-eating husband, and we all loved it. Huge portions!! Definitely a re-make. I've been really trying to cut back on carbs a little bit, but I LOVE pasta dishes like this one. I wonder how this exact recipe might be if I subbed out the noodles for zucchini ribbons (they're my new fave thing!) Ya think that would be okay or weird? This is so good! I will save calories through the day and eat a double portion sometimes and really fill up. 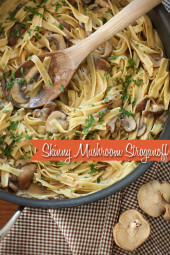 Tough for me to find all the mushrooms so I used baby bellas only and shallots! Just made this last night. It was delicious! By far the best non-meat version I've found. The only change I made was using shallots instead of the onion. I too was able to find a vegan Worcestershire, which was great. Thanks for the recipe! This was amazing (as have been the other two or three dozen recipes we've made from ST)! It's in my top 5 from ST. This tasted to me like a dish we might get from this really great Italian restaurant we love in Newport, RI. I'm making it again this week because it's that good. But, I may try doing homemade noodles – my first attempt at whole wheat – and then it REALLY WILL be like a dish from our favorite Italian place in Newport. The only change I made was to use all regular button mushrooms b/c that's what I had at home. I browned them up first, removed them from the pan, and then followed the recipe as written. Just made this for my husband & myself. It's a keeper for sure. Followed the recipe and only added an additional dash of worchestershire sauce. Wouldn't change anything else…Delicous. So glad I found this on Pinterest. Thanks. Great recipe. I substituted sour cream for coconut milk and pasta for spaghetti squash for a veggie/vegan take on this recipe. delish. Anyway, I did alter it a little bit. I did not have worcestershire sauce so omitted that, added a little bit of garlic while cooking the onions and butter, used a whole wheat flour (but found the sauce wasn’t thickening so I had to add lots more than the recipe called for), had to add a lot more salt and pepper than I would have liked to. I used a non low sodium broth but it had no flavor so I felt the need to add more on my end. Also, I used white mushrooms and baby bella for mine. 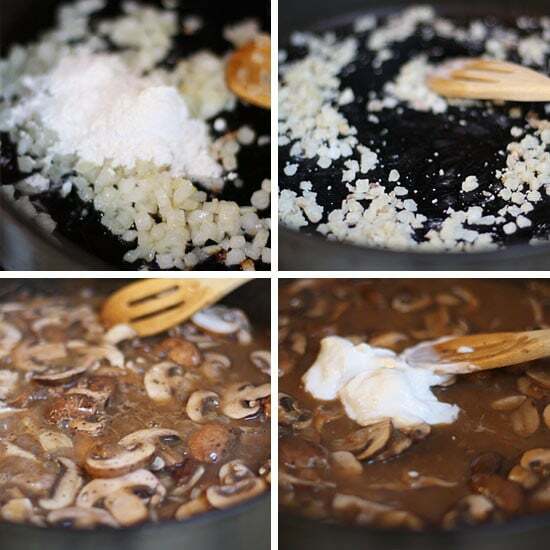 This appears somewhat similar to a mushroom ragu I enjoy making, except we use Sicilian Marsala wine instead of white wine. We put it over boiled polenta (3 points for a cup), which I think is a little lower in points than using noodles. I made this tonight! It was good, although my sauce was pretty thin. I think I will use less broth next time. I also forgot to get vegetable broth, and all I had at home was chicken, but it tasted fine with the chicken broth. I was surprised that I loved the No Yolks Noodles. I am an egg noodle freak, so I was always hesitant to try them, but they were great. I love whole wheat noodles, too, so I think this would also be good with those. I used baby bella, white, and shittake mushrooms. Next time I think I might use portabellas and cut them up, since they have a richer flavor. Either way, great recipe! I just finished eating this. OMG so yum. Do you think the sauce would freeze well or would it make the shrooms rubbery? I made it & it was DELISH!!! Bourbon Barrel Worcestershire is the best! 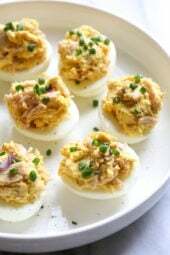 – but I may be partial since I'm from Louisville =) This dish sounds amazing! This was absolutely amazing! My husband asked for this dish tonight and I admit that I was a little skeptical since the list of ingredients was so… ordinary. To my surprise and delight, it was incredibly flavorful and full of a really interesting variety of tastes and textures. Great job of turning simple/standard ingredients into something really special! Loved the earthiness of the mushrooms/worstershire contrasted with the bite of the noodles (I cooked gluten free rice fettucini al dente), combined with the freshness of the parsley. Did not miss meat or other veggies at all. What can you substitute for the Thyme? I do not like Thyme at all…. I didn't have thyme so I just used dried parsley instead. Tasted great! Just made this with a friend for a ladies night in and it was superb! It was creamy and rich in flavor without making us feel sluggish after. I will definitely be making this dish again. I made this tonight for dinner. It was fabulous, I could have eaten the whole thing all by myself. Yum, yum, yum. I don't think I will ever make it with meat again. Thank you for your wonderful recipes and I did "Pin" this. This was awesome! I used plain greek yogurt instead of sour cream and whole wheat spaghetti noodles (because I already had them and I'm trying to be better about pantry management) and no wine (because I didn't have it on hand), and it was still delicious. Leftovers were great for lunch today! A great fall meal. Made this tonight after someone recommended it. Normally I'm not a stroganoff kind-girl but this was fantastic. I used yoke-free noodles, and I didn't happen to have any sour cream (or plain yogurt) on hand but I did have Philadelphia's reduced fat garlic cooking creme (I have no experience using this so I was nervous) and I was desperate to use up the baby portabellas and white mushrooms in my fridge. Even with the cooking creme it cam out fantastic! Also, my herbs were dry and it was still delicious. Gina-I love your blog-would gluten free flour work in the same regard to create the roux? I am a new gluten free-goer, but a food lover and don't want to give up on recipes bc of flour. Made this last night. Hubby, daughter & I loved it (son wasn't home…but he doesn't count since he doesn't like mushrooms). This recipe is going in the make again file. Thanks & keep 'em coming! This was so tasty! Might add some brandy or whiskey next time instead of the sherry. I also used only a can of beef broth, so I was short by about 1/4 cup – sauce wasn't runny at all! Made this last night and it was delcious! Hooray for leftovers! One comment: To get to the "thick and bubbly" stage, I cranked up the heat to medium-high and stirred for 9-10 minutes instead of 4-5. That caused it to thicken up nicely. My son loves mushrooms but I do not. He had two bowls full! Thanks! I cant wait to try more recipes! Had this last night with roasted spaghetti squash in place of noodles. We left out the tomato paste and cooked the mushrooms at least twice as long as the recipe said too. It was amazing! Even hubby didn't miss the meat. Thanks so much for your awesome recipes Gina! I made this with Tofutti soy sour cream and it was delicious. Mine was thick at first but when I added mushrooms I got more liquid in the sauce and it was too saucy. I doubled the amount of tomato paste. It was delicous. Have two servings in the freezer – I think it will reheat just fine. I made this exactly as written and it is delicious! Great recipe. Gina this was amazing…again! Have made it twice already. You need a show on Food Network! I can't WAIT for your cookbook. I second that request for a Food Network show! You should go on the next Food Network Star lol. Oh my goodness! This was soooooo good. My mom didn't believe me when I told her it was healthy! Beware, this was a 4 person serving, and we devoured it between the two of us.. I made this dish last Sunday, and my boyfriend and I adored it! Thank you so much for the wonderful recipe! Made this last night and followed the recipe to a T. It was SO good! My husband gave it a "10". Delicious!!! I tried this over the weekend (except I only had sliced white mushrooms on hand and tomato sauce instead of paste since I didn't have any). It was delicious! This is delicious! Used Madiera wine in place of sherry. The second time I made it I forgot the sour cream and realized I liked the sauce even better without it! This was delicious! Thanks for sharing. We added some vegetarian meatballs in with the mushrooms, too. Mmm! Nice flavor but a bit thin. Could I cut down or out the broth? I like my stroganoff to cling to the noodles, and this just ran all over the plate. Sure, you can cut back 1 cup and see if it's not too thick, add more if needed. Freezing and reheating suggestions actually. I'm not sure how this freezes, haven't tried it. If anyone does, please comment. Can I substitute red wine for the white wine in this recipe? We did since that's what I had open and it turned out fine. made this tonight and just wanted to say it was great. did not miss the meat. I think the mushroom sauce would also be great over chicken. I wanted to stop by to let you know that I featured this on my site today in my "What I Bookmarked This Week" post. Stop by and see! I made this last night and it was so good! I couldn't find vegetarian Worcestershire sauce so I used a tablespoon of bbq sauce instead. My boyfriend loved it too! Gluten free flour should be fine – the flour is really just for thickness, not for flavor. You could probably use cornstarch too. what would you substitute for the flour for a gluten free version? Just a gluten free flour? Obviously GF noodles…but I have a favorite brand of those already that I use for everything! I added some chicken to this recipe and cooked it with the onions at the beginning, it is delicious, though definitely adds more points! Well done! This was so awesome. I did add some ground turkey but used TONS of those mushrooms. I think I ate 7 servings while my husband ate 1 and the kids ate the noodles. Their loss, my gain!! I'm not sure what I did wrong – followed as listed, but this was very runny and almost like a soup vs. pasta with a sauce. Good flavor, but too thin. We had the same problem here. The sauce turned out very runny. I cooked it longer to try and boil out some of the liquid but no luck. 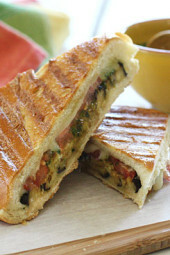 Making this tonight and it's lovely!! This recipe was awesome! Thank you so much! It was easily converted to vegan and absolutely delicious! For the worcestershire sauce I used wizards vegan, which I got at the healthfood store. Used tofuitti better than sour cream, fettucini instead of egg noodles, and earth balance for the butter. My kids (4 and 6) gobbled it up like I hadn't fed them all day, haha! I hope you keep posting meatless Monday meals! THANK you for those subs!! 🙂 I was wondering on the sour cream, and didn't want to lose that creamy consistency that I love about stroganoff by using our almond milk. And thank you, Gina, for an awesome recipe!! We're nuts for mushrooms here! Okay – YUM! this recipe has the perfect numbers (carbs, protein, fat) for me and my sweetheart who put in Mountain bike rides and training. Definately keeping this on handy. Thank you so much. I am trying to eat less meat and this meal is really good. This was a hit with the whole family, even my 8 y.o. DS and 5 y.o. DD. it's a keeper! For us mushrooms lovers…this is divine!! Thanks Gina, YOU ARE THE BEST! This recipe looks great! reminiscent of my childhood without the meat. I often times substitute plain greek yogurt for the sour cream. I can't wait to try it. Thanks for sharing it Gina! I wonder how this would be with quinoa. I may have to try it, sounds delish! For those looking for dairy free sub for the sour cream – try coconut milk! I have a daughter with a disability (Prader-Willi syndrome) that causes her body to calorically require about 60% of what a same age peer requires. Because of that, I LOVE your site! I am part of a conference planning committee that is hosting a conference for parents with children with the same disability. I'd love to share your website with the conference attendees. Will you please contact me to discuss this more? The "meatiest" mushroom is portobello. You could try those for a meatier taste. I made this last night and it was delicious! I think I may saute the mushrooms with the onions next time to give them that nice meaty flavor. But it was good just throwing them in raw too. Can you freeze left overs? How long would it last? I always get nervous about freezing dairy (butter in this case). I wouldn't freeze this one. Freezing butter is totally acceptable. I don't use butter very often, so I keep it in the freezer. I've been doing this for years! Made this last night and it was great! Next time I think I will add the mushrooms after the onion and let them cook down a bit more. They were a bit too raw for my liking. 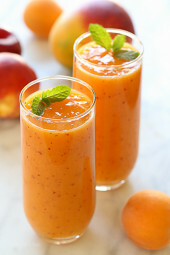 I hope the leftovers have time to soak up all the juice and soften before lunch! Could I use greek yogurt instead of sour cream? I LOVE the look of this, but am not a fan of sour cream. Ooh, I'd like to know the answer to this too. I rarely eat sour cream and usually buy it for one recipe and it goes bad before I use it all. But I always have greek yogurt in the house. That's a better option for me, but is there anything that could be used instead that's dairy free? I personally prefer to use sour cream, yogurt can curdle. Dairy free – I suppose a dairy free creamer would work? One more substitution question- what could be used in place of sour cream? Hey Gina, unable to find your recipe for Bourbon Barrel from Kentucky. Where is it? I just finished cooking this! I had to omit a few ingredients (Worcestershire, tomato paste, and thyme) because I am a broke college girl with a limited pantry BUT it turned out awesome! I decided also to add garlic. I am bringing it for lunch at work and with me to my night class for dinner! I couldn't stop picking even though I had already eaten tonight. Absolutely wonderful, thanks Gina! great idea on the tomato paste – I hate throwing it out but never seem to use it much so this is a great idea on how not to waste it! Thank you! So good! And what a wonderful size portion! Made it tonight! Wow. Wow. Wow. Great timing on this one. Made it … tonight. Easy easy. At what point do you put the tomato paste in? It's on list but not in the recipe. Sorry, with the worcestershire sauce. Made this tonight. Very good and filling. I subbed polenta for the noodles and it was great! 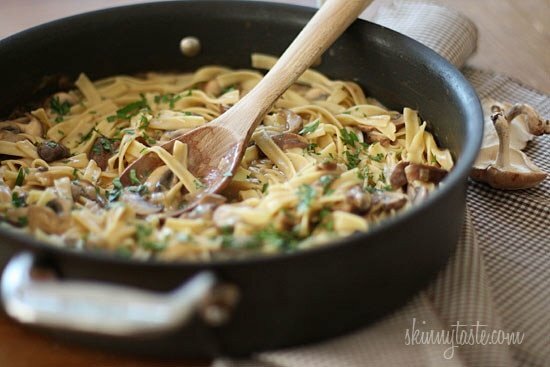 I can't stand mushrooms except for in mushroom stroganoff! I am vegetarian, so this is the perfect recipe. Thank you for the vegan Worcestershire recommendation! In the three years of being vegetarian I have yet to find a good vegan substitution. I don't know if I missed it but where do you add the tomato paste? After the Worcestershire sauce. Sorry! Perfect, that's what I guessed. Delicious, thanks for another great recipe. Half my weekly meal plan comes from your website! i just made this. it is great. my 3 year old (think he) picked it out and is on bowl #2 at the moment. just wondering if i missed the part where it says to add the tomato paste… i forgot about it until i was simmering and added it then and it still tastes great. just curious if i am blind or if i wasn't supposed to add it? This looks beyond delicious. I do wonder about the mushrooms, though, bellas aren't too bad, but anything else is a little one the expensive side here. Do you think it would drastically change the flavor to use bellas and white? It would be fine! You can use all white, still good! I made this with a variety (shiitake, oyster, baby bella) the first time and it was wonderful, but ended up being quite expensive for a made from scratch dinner. This week I bought a bunch of frozen white mushrooms at the store so I am going to make it with those. I'll let you know how it goes! Do you think you could substitute spaghetti squash for the pasta? or would the squash not hold up…. Is the Thyme measurement for fresh or dried? This is also a question I have for all of your recipes, do you generally use fresh or dried herbs? I use both, this happened to be fresh but either way it would be the same on this. It's to taste, any fresh herb works well here. Gina, what brand of noodles did you use in the picture? They look like no yolks, but I know you've said that you prefer Ronzoni Smart Taste – I've just never seen them in a noodle that looks like those in your picture. I ran out of Ronzoni when I made this round and used no-yolk, but I really preferred the texture of the Ronzoni better. I'd say cook the noodles until almost done, then add to the pan with the mushrooms etc. They will then cook to perfection in the last bit of heat in the pan. If they absorb a touch of the sauce, keep a few tablespoonsfull of the pasta water to add back into the dish to the consistency you want. Exactly! Or add more broth, thanks Vivian! I am SOOOO excited you did this recipe. Mushroom Stroganoff is my favorite dish. I have a question….and maybe I missed it somehow. Do you have to cook the noodles before adding them? I apologize, but I have never used this type of noodle, and want to be sure I am not missing a step. Shona I forgot to add that step, I just added! Thanks for mentioning. I was reading the comments thinking the exact same thing. I'm assuming you will cook the noodles before hand as you add them just at the last minute and serve immediately. Thank you for this recipe. I have been cooking a similar dish for years and called it mushroom stew. The only difference with mine was we added sour cream or yogurt at the table as everyone does not tolerate the white ingredient. I shall make it more often now with the different kinds of mushrooms that you suggested. BTW love to read your recipes and can hardly wait each day. Thank you! I don't mean this to sound witchy, but I thought Cremini mushrooms and baby Bellas were the same thing. Is there another name for either? Ha! They may be! They were labeled different. You can use whatever mushrooms you find, white work great too. I could be wrong, but I think cremini's are full grown bellas and baby bellas are smaller. They do have slightly different flavors. Portabellas are the mature version of cremini's….just like puppy is to dog, cremini is to portabella…the cremini's are sold commercially as "baby (porta)bellas"
Can anyone tell me if this can be made about an hour ahead of time and then kept warm in the oven? Would taste, texture be impacted? Thanks for your advice!! I think it should be fine, but wait till serving to add the sour cream. I have issues with alcohol, so I prefer not to have it in the house even for cooking. Most times I substitute a bit of balsamic vinegar for wine, any suggestions on what to replace the sherry with? More broth would work, I bet a splash of balsamic would be great too. Mike – Some people use grape juice as a substitute for wine. Marsala Cooking Wine is great and should have fewer issues. It will also complement the flavors in the recipe nicely. What do you use instead of mushrooms? We hate them in our house! I would search for Tofu Stroganoff, which you can make without the mushrooms. You could also look for seitan stroganoff. Or probably even just sub it in this recipe. Why would anyone even bother with a recipe that's totally about mushrooms if they hate mushrooms lol. I agree! It makes no sense. Just FYI – most store bought Worcestershire sauces have anchovies in them. Not completely meatless, but delicious looking! Good point, I should mention I have a vegetarian one, it's called Bourbon Barrel from Kentucky. Good to know! My boyfriend is vegan, and we haven't been able to find a store bought one. Thank you! This is dinner tonight for sure. Since I'm vegetarian Ill be substituting the Worcestershire sauce with Braggs Liquid. I need to go and check out the Bourbon Barrell you suggested. Annie's worcestershire is vegetarian. It's in the natural food aisle at my regular grocery and every natural food store I've ever been in.